In this updated and revised edition, James DiEugenio dissects the new Oscar-nominated film, The Post, and how it disingenuously represents the Pentagon Papers saga, to the detriment of the true heroes of the operation. The story of the film stems from the failed attempt of Academy Award–winning actor Tom Hanks and producer Gary Goetzman to make Vincent Bugliosi’s mammoth book about the Kennedy assassination, Reclaiming History, into a miniseries. He exposes the questionable origins of Reclaiming History in a dubious mock trial for cable television, in which Bugliosi played the role of an attorney prosecuting Lee Harvey Oswald for murder, and how this formed the basis for the epic tome. JFK: The Evidence Today lists the myriad problems with Bugliosi’s book and explores the cooperation of the mainstream press in concealing many facts during the publicity campaign for the book and how this lack of scrutiny led Hanks and Goetzman—cofounders of the production company Playtone—to purchase the film rights. DiEugenio then shows how the failed film adapted from that book, entitled Parkland, does not resemble Bugliosi’s book and examines why. This book reveals the connections between Washington and Hollywood, as well as the CIA influence in the film community today. It includes an extended look at the little-known aspects of the lives and careers of Bugliosi, Hanks, and Goetzman. JFK: The Evidence Today sheds light on the Kennedy assassination, New Hollywood, and political influence on media in America. 5.0 out of 5 starsNot believable then, not believable now. The JFK assassination was a somewhat unique event in that it was a pivotal event in post WWII US history where the official story is not believed by the majority of people. As such it's kind of a red pill of US history with ample evidence that things are not what they seem. I think part of the reason it's covered up to this day is that if high level conspiracy is admitted here, then questions will be asked about other events. Questions the powers that be would rather not answer. I believe DiEugenio characterizes Bugliosi's tome as a prosecutor's brief, which is accurate. He starts with a presumption of Oswald's guilt and fills in the details, accurate or not, that back up his conclusion. JD spends a good part of this book countering his evidence and showing that the evidence against Oswald was riddled with problems, and that there is a whole web of evidence that points to something much more than a lone nut (who was himself apparently killed by a lone nut). I think Boston Bill's characterization of DiEugenio as Columbo is apt. Not the most polished writer or speaker; his writing style takes a bit of getting used to. He likes to turn clauses into full sentences and at times I had trouble following a complicated train of thought and had to reread passages a few times to comprehend it (maybe that's my problem, though). However, he did do a good job of breaking up the chapters into 1-4 page subsections which are more easily digested. This not a book for beginners to the JFK assassination literature, although once you have the basics, this is a good next step in that it addresses a lot of the problems with the lone nut theory and confronts the mainstream media's inability do deal honestly with this issue, 50+ years and counting. I also enjoyed the peripheral material- Bugliosi's work on the Manson case, and critiques of Hanks, Spielberg, etc. as historians. I gather that DiEugenio's politics are left leaning, although he is disenchanted with the Establishment Left (or "Loony Left" as he sometimes calls it). As Mr. Couteau mentioned, DiEugenio maintains the kennedysandking.com website, which is frequently updated with new material related to the 60's era history changing assassinations. He is also a frequent guest (usually a few times a month) on blackopradio.com, hosted by Len Osanic. His ability to speak almost extemporaneously on this and related topics shows a remarkable breath and depth of knowledge. He must be a voracious reader to be versed on the works of so many of the JFK assassination researchers. Bottom line, if you are looking to dig a bit deeper into the JFK assassination this a must read. 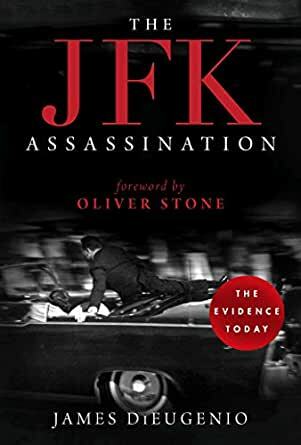 This critique of Vincent Bugliosi's sharply slanted work on JFK's assassination serves as a scaffolding for a concise review of both the older and the newer evidence which conclusively demonstrates that this epochal event was the result of a high-level government conspiracy. Furthermore, this book highlights the obsequious and irrationally persistent support among major news media, and even historians, for the thoroughly discredited conclusions of Warren. More proof, I suppose, that the "winners" write the history books, even if those winners are brutally violent and completely deceptive elites, bent on using every manner of political and economic power, supported by constant propaganda, to advance their own interests, to the detriment of every other human on earth, and of the earth itself. Distinguishing this book as well is Mr. DiEugenio's linking of the decline of American cinema to the insidious growth of the tentacles of the National Security State into the power structures of Hollywood. One reservation I have is the author's less-than-insightful invocation of the discredited blowback explanation for 9/11. That 9/11 was an operation of the U.S. Government is, by now, as well-established as is the fact that JFK was the victim of essentially a coup d'etat. Surely he should be aware that the two events share a monstrous similarity: in each case, the official story makes no sense, at any level of inspection. Does Mr. DiEugenio really believe that government agencies which would murder JFK, RFK, MLK, and a large number of foreign leaders who threaten American hegemony and carry out an unending series of violent, illegal, and unconstitutional foreign interventions leading to the unnecessary deaths of millions of innocents (among countless other crimes against humanity) really balk at killing a couple thousand American citizens on 9/11, in what was clearly to the elites a NECESSARY propaganda operation. Surely they would not, and did not, balk when cognizant of the enormous advantages that this false flag would provide them. After all, what legal, constitutional, and moral lines had these brutal elites not already enthusiastically leapt over? 5.0 out of 5 starsThink you know everything about the JFK assassinaton? You don't until you read this book. The earliest researchers of the JFK assassination, people such as Mark Lane, Harold Weisberg, Sylvia Meagher, Jim Garrison and Gaeton Fonzi have passed away. James DiEugenio picks up the torch. He not only builds on the work of those who went before him, he ferrets out the latest evidence of just how corrupted everyone was who sold us the preposterous lie know as the Warren Report. In this book Mr. DiEugenio uses the book "Reclaiming History" by Vincent Bugliosi as a vehicle to present the true facts side by side with the Warren Report fiction which Vincent Bugliosi tries to defend in his monstrous book. Monstrous is the perfect word to describe Bugliosi's book. It's monstrous in size, and monstrous as in shockingly wrong, deceitful and just plain evil. Bugliosi spent most of career in the Los Angles DA's office. He was a virtual celebrity prosecutor. He might have been a celebrated prosecutor working on famous cases out of the Los Angles DA's office, but he wasn't Columbo. The real life Columbo in the JFK case today is James DiEugenio. You might be well read on the JFK assassination and think you know all the minute details of the crime, well think again, read this book to get caught up. James DiEugenio is one of the most devoted researchers of the JFK assassination, and his work has continued to revolutionize the field. His prior book, Destiny Betrayed (second, revised edition), is one of the best on the subject; and with The JFK Assassination he continues to plumb ever deeper into the facts behind Kennedy's murder and the cover up that ensued in the mass media. Make sure to visit his web site, "Kennedysandking," which is the best online source of JFK-related information. Refutes Reclaiming History and the film Parkland well.